According to the BBC, Man City’s chief arse Joey Barton has been suspended for the rest of the season for striking team-mate Ousmane Dabo during a training session. Dabo, a French midfielder signed from Lazio in 2006, reportedly had to go to hospital with mouth injuries. 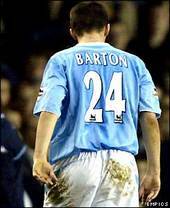 Barton’s agent, Willie McKay, told BBC Sport: ‘As far as I’ve heard, he [Barton] was defending himself. But because it is Joey it makes headlines.’ City confirmed that there was an incident but the club have not said which player it was, yet. So where’s the new, more mature Joey Barton we heard about? I like Barton’s honesty, but he really doesn’t help himself, does he?